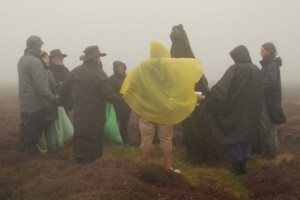 In July this year, Leodis Pagan Circle hosted a tour of sites that are of Pagan significance based around the North York Moors. One of our members, known as Farmer Jeff, was so taken with one of the sites that he was inspired to go back and perform a ritual there and I was honoured to be invited along. As you all know, the summer this year has been one of the warmest and sunniest for a very long time but on Sunday 10 August – the day of the ritual – it was teeming with rain. Undeterred, however, a small group of us valiantly set off for Sleights Moor to take part in the ceremony that had been written and organised by Farmer Jeff. The purpose of the ritual was to breathe new life into the remote moorland landscape and seemingly dejected stones known as High Bridestones. The High Bridestones are a group of stones located amongst the heather and bogs, just a few meters away from the road linking Grosmont to the busy A169. They’re thought to be the remains of two small Bronze Age stone circles. Many of the stones have fallen over but some are still standing and some people obviously know they’re there because visitors have left offerings of coins in the nooks and crevices of the tallest upright stone. On the day of the ritual, the early birds waited in their cars for the stragglers to arrive because the rain was beating down so hard that crash helmets were more use than umbrellas. Everyone was in high spirits though and there was a strong camaraderie as we chatted to each other through the car windows and on our phones whilst sipping hot toddies from a flask. When we were ready to begin the ritual, the rain was torrential; there was a strong, biting wind and there were puddles turning into lakes as far as the eye could see. We never even thought about abandoning our mission though and we were laughing and joking as we splashed our way through the drenched heather to the starting point. Jeff went on to lead a beautiful, poignant ceremony with everyone else taking part in one way or other and I can honestly say it was one of the most exhilarating experiences of my life so far. The grandeur of the moors, the majesty of the stones, the supremacy of the elements, the feeling of joyful fellowship amongst the group and the emotive ritual, all came together to make the day forever memorable. Despite the general solitude of the moors and the bleak weather conditions, I’m sure the whole area felt revitalised when we left that day. In fact, I do believe the participants had an extra sparkle too. We may have looked silly to passers‑by but we didn’t only have a spiritual experience that day, we had a lot of fun as well. It was beyond doubt a special day, the energy we created in the cold and rain was amazing, despite the weather I really enjoyed the ritual and would love to do another one there, its such a vibrant place.